Year after year, change is inevitable. But it’s also hard to keep track of every rule change, every year. Luckily for you, we stay ahead of the game with compliance that anticipates. All the same rules from 2018 still apply – but penalty amounts are changing. We’ll keep you posted as soon as they’re released! Here’s a quick look at ACA regulation changes from 2015 to present. The lookback period to determine ALE status for 2015 can be anywhere between 6-12 consecutive months in 2014. Employers with 100 or more full-time and full-time equivalent employees must offer health insurance to full-time employees. ALEs must offer coverage to the employee but not dependents if dependents had not been previously offered coverage and the employer takes steps in 2015 towards offering dependent coverage. ALEs must offer coverage to at least 70% of full-time employees in order to avoid the 4980H(a) sledgehammer penalty. ALEs subject to the 4980H(a) penalty can disregard their first 80 full-time employees when calculating the penalty. The amount of the 4980H(a) penalty is $2080 per employee per year. The amount of the 4980H(b) penalty is $3120 per employee per year. In 2015, a conditional offer of insurance to a spouse was reported as a regular offer. The lookback period to determine ALE status for 2016 and all future years is the full 12 months of the prior year. Employers with 50 or more full-time and full-time equivalent employees must offer health insurance to full-time employees. ALEs must offer coverage to the employee and his/her dependents up to age 26. ALEs must offer coverage to at least 95% of full-time employees in order to avoid the 4980H(a) sledgehammer penalty. ALEs subject to the 4980H(a) sledgehammer penalty can disregard their first 30 full-time employees when calculating the penalty. The amount of the 4980H(a) penalty is $2160 per employee per year. The amount of the 4980H(b) penalty is $3240 per employee per year. In 2016, a conditional offer of insurance to a spouse must be reported separately. The lookback period to determine ALE status for 2017 and all future years is the full 12 months of the prior year. The amount of the 4980H(a) penalty is $2260 per employee per year. The amount of the 4980H(b) penalty is $3390 per employee per year. In 2017, a conditional offer of insurance to a spouse must be reported separately. The lookback period to determine ALE status for 2018 and all future years is the full 12 months of the prior year. The amount of the 4980H(a) penalty is $2320 per employee per year. The amount of the 4980(b) penalty is $3480 per employee per year. In 2018, a conditional offer of insurance to a spouse must be reported separately. government regulations. This information is not intended as tax or legal advice. We encourage our readers to consult their tax and law advisors. Viventium was instrumental in helping my company become ACA compliant this past year. 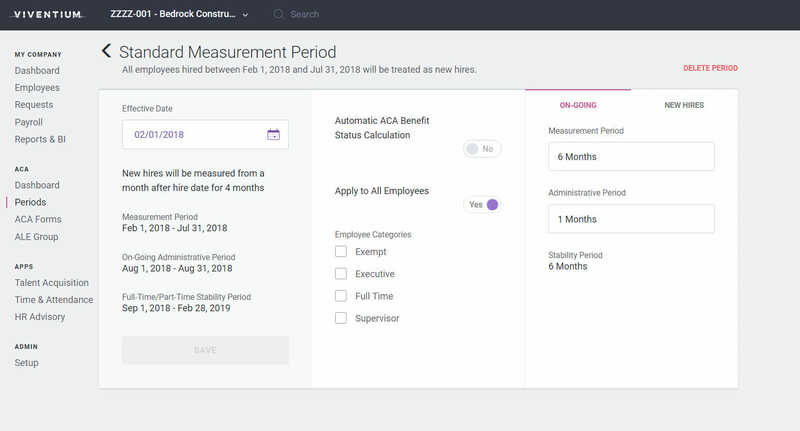 After I listened to one of Viventium’s webinars on ACA compliance and reporting requirements, I realized we weren’t doing enough. Viventium’s extremely helpful and responsive service alleviated a huge stress from my shoulders. For the year 2019, employers with 50 or more full-time employees or equivalents must offer health coverage to full-time employees and file Forms 1094-C and 1095-C with the IRS. Filings are due to the IRS in the first quarter of 2020, and a copy of the 1095-C must be distributed to each employee by January 31, 2020. Employers who fail to offer health coverage and file Forms 1094-C and 1095-C may be subject to IRS penalties. Are You an Applicable Large Employer (ALE) in 2019? To determine ALE status during the current year, employers use a lookback period during the prior year. 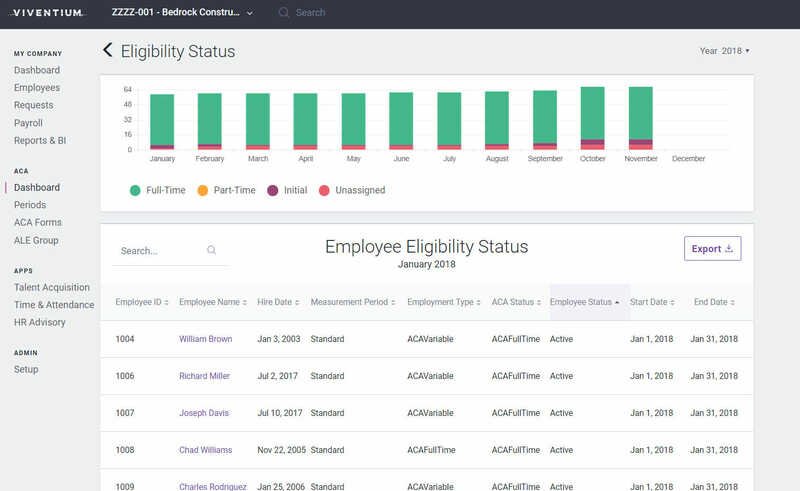 If an employer has on average 50 or more full-time employees, including full-time equivalents, during the 2018 lookback period, the employer is an ALE for 2019. Learn more about the Affordable Care Act by visiting our ACA FAQ page. 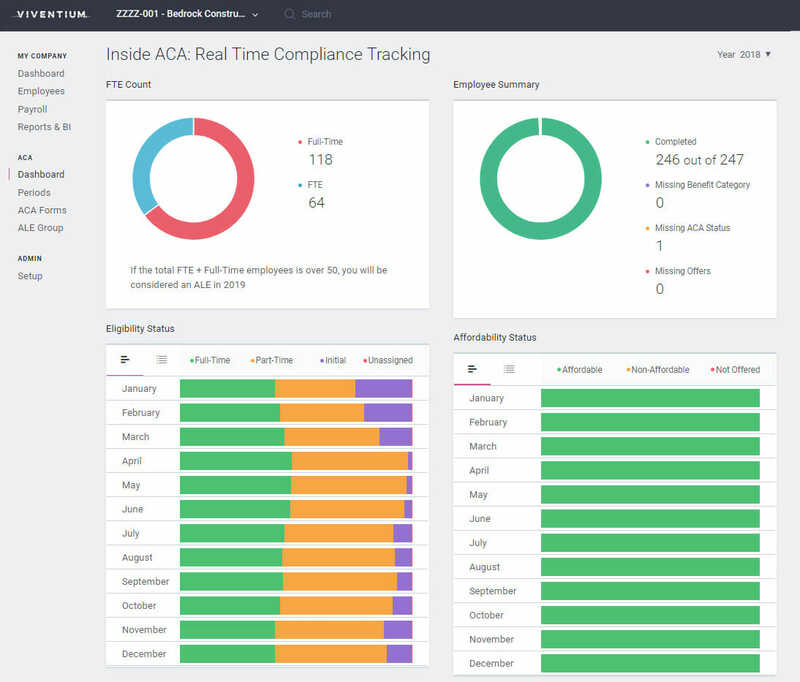 Viventium’s ACA software solution keeps you on top of your compliance, delivering live ACA data throughout 2019. At the beginning of 2020, Viventium will prepare and file Forms 1094-C and 1095-C on your behalf.